Coaches at every level wish their goaltenders controlled rebounds better. Rebound control can be improved by every goalie at every level from youth through pro. Goalies know that they need to control rebounds; but they often don’t know “how”. This article will focus on the overall approach to the shot and post save response in order to help goaltenders with this difficult skill. Shot approach: This goes back to footwork before the shot. Being square, set, and on-time while maintaining appropriate depth makes puck tracking and ultimately controlling rebounds much easier. The goaltender will have to make less “desperation” saves, which makes controlling rebounds extremely difficult. Puck tracking: Reading the release of the stick and tracking the puck as soon as it leaves the blade allows more time for the goaltender to determine the path of the puck. This also includes following pucks into and away from the body. Reading the situation: Knowing where the most imminent dangers are, and what options the shooter has will help the goaltender determine where they should direct the rebound. There are several “technical” skills that the goaltender must know about in order to either “trap” or “direct” the puck to a safe area. These “technical” skills will be broken down into 3 categories (Low, Mid, and High Shots). With all of these saves the goaltender should “shift” into the puck. Shifting means the goaltender is dropping as much of their body towards the puck without “sliding” into the shot. See the pictures below on shifting. Low: Low shots are the most difficult to control. Stick involvement and pad angle in relation to puck direction determine what save technique should be used. The stick is the easiest way to control shots on the ice. 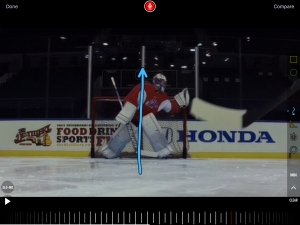 Rotating the stick in an arc can easily deflect the puck to the corner when the goaltender has time to “react”. The pads should still be down on low shots as a back up if the stick misses. If the stick misses the goaltender should try to angle the pad towards the corner, and use the shin of the pad as the most predictable method. The situation and angle the puck is shot from determines what pad or stick angle should be used. Mid: Pucks shot high on the pads and in the mid section should be controlled using a butterfly and allowing the puck to “stick” to the goaltender. Bring the gloves to the puck after the puck has hit the body. The goaltender needs to give with the shot to assure there is no rebound. Shots blocker side just above the pad is a difficult save as the goaltender must butterfly and rotate the blocker at the same time. High: The easiest to control by using the gloves or armor. Pucks should be caught in the webbing whenever possible with the glove. They should also be caught in front of the body to assure puck tracking into the glove. 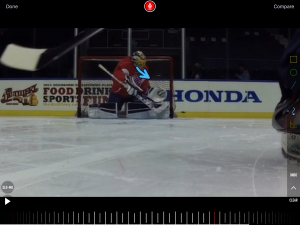 Shots to the blocker should be turned to the corner by rotating the wrist. As you can see rebound control is much more difficult than many people realize. Starting with a good approach and early puck tracking ability combined with proper save mechanics will improve rebound control when there is time to react. More advanced rebound control on “blocking” saves such as the narrow butterfly and paddle down will be discussed in later articles. Figure 1. Shifting into high shot. Upper body is moving towards the puck. Figure 2. Shifting into mid height shot. Notice how the goaltender center “shifts’ towards the puck. Figure 3. Shifting into puck on low shot. Chin down to track puck to and away from body. For more information on Janosz School of Goaltending Camps, Clinics, and Private training go to www.bobjanosz.com or call 716-308-9224.